Are you sure you want to place a back order for this item? This MCA manual provides the supporting theory, load tables, relevant problems, and illustrations regarding connection details for roof or wall diaphragm assemblies. The scope of the work includes a variety of material connections: elevated side flat fastening, top flat fastening, bottom flat fastening, fastening to wood, aluminum and steel as well as structural members and fastening of exposed cladding. 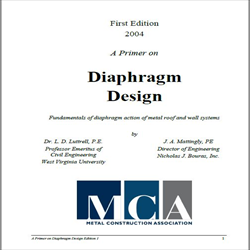 This manual provides an extremely valuable design tool to professionals in the metal construction industry. This edition replaces the 2001 first edition manuscript with the pale blue cover. A typical diaphragm assembly consisting of metal roof or wall panels, purlins, girts, fasteners or welds and the main structural framing are subjected to external forces such as wind, seismic ground motion or asymmetric loading. These forces are transferred to the diaphragm where the panel geometry and connections can determine the diaphragm's shear strength. This manual contains strength and behavior formulas that take into account a wide variety of panel types, connection/connector patterns, effects of insulation and other construction details. The results are based on research sponsored by the MCA and performed at West Virginia University under the direction of Dr. L.D. Luttrell, P.E. Are you sure you want to report this review as abusive? The review has been flagged as inappropriate and will be checked by our staff. There are not any reviews for this product. © Metal Construction Association. All Rights Reserved.